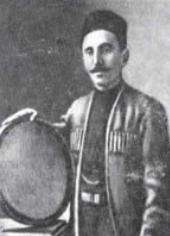 Jabbar Garyagdioglu or Garyaghdyoglu (Azeri Cabbar Qaryağdıoğlu, pronounced [dʒɑpˈbɑr ɡɑrjɑ:ˌdɯ.o:ˈlu]) (March 31, 1861, Shusha – 20 April 1944, Baku) was an Azerbaijani folk singer (khananda). He is known as the first khananda to perform mughamats in the Azeri language. He was born in the Seyidlar neighbourhood of Shusha, to a family of a dyer. His stagename Garyagdioglu literally translates from Azeri as Son of Snow-Has-Fallen. According to an urban legend, Jabbar's father Meshadi Ismayil was an extremely reserved and taciturn man and as a result, would often be asked in an idiomatic way, common to Azeri: "Why are you so gloomy? Has the snow fallen?" Therefore he was nicknamed Garyagdi (Anglicisation of qar yağdı - "snow has fallen").